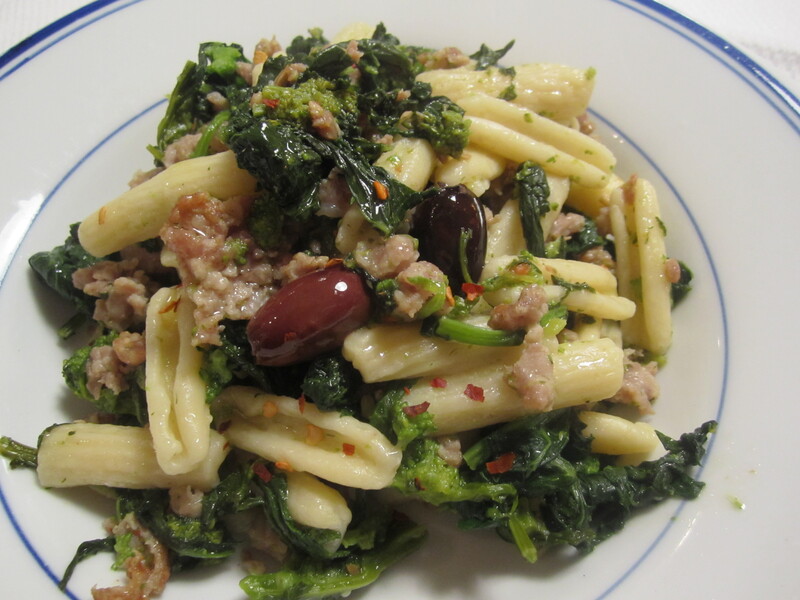 Pasta with broccoli di rapa and sausage is one of my favorite pasta dishes, and one that I make often–especially in the colder months. I vary the dish from time-to-time in different ways. Sometimes I boil the sausage first, then slice it into thin rounds. Sometimes I use fresh Italian sausage, removed from its casing and chopped finely as I saute it (no pre-boiling necessary). Sometimes, I substitute a cured sausage, like andouille or chorizo, for fresh sausage. Sometimes I eliminate the sausage entirely. Tonight, I’m using fresh sweet Italian sausage. 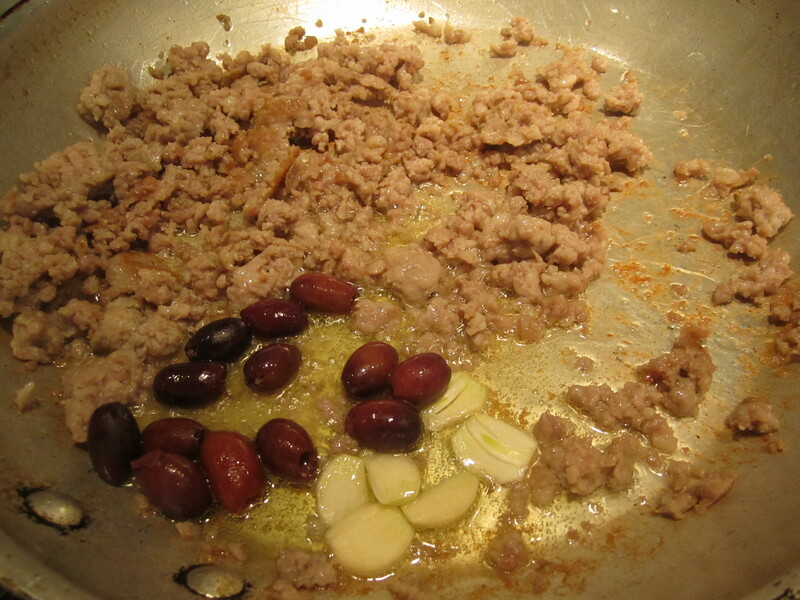 In addition to the sausage, I’ve added olives–pitted kalamata olives. Olives deepen in flavor and take on an entirely different character when they’re fried or roasted in the oven. Their normally high acidic notes are greatly tempered and they become rich and unctuous. When fried, they retain just enough of a salty bite to punctuate the bitterness of the broccoli and the richness of the sausage. Tonight, as our pasta, we’re having cavatelli. Cavatelli are found in the freezer of most supermarkets. They’re a great pasta to make for guests–they can actually be fully boiled ahead of time (unlike most other pastas which should be boiled and served only at the last minute lest they overcook). Cavatelli are sturdier and more forgiving–they can be boiled, drained, placed atop the sauce or condiment, let sit undisturbed while you have a first course or antipasto. When you’re ready to serve, simply turn the burner under the skillet of pasta to high, toss pasta and sauce together with a couple of ladles of pasta cooking water, drizzle with oil and serve. Although I’m not serving guests tonight, I appreciate the ability to completely cook the pasta prior to sitting down at the table. 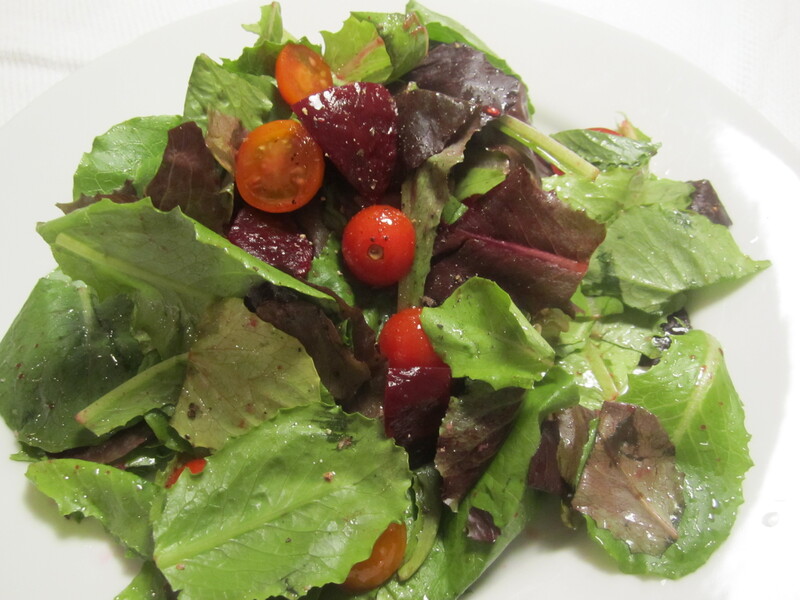 We’re starting with a salad of baby romaine lettuce, beets and cherry tomatoes (from my neighbor Beppi’s garden), then going on the pasta as our main course. 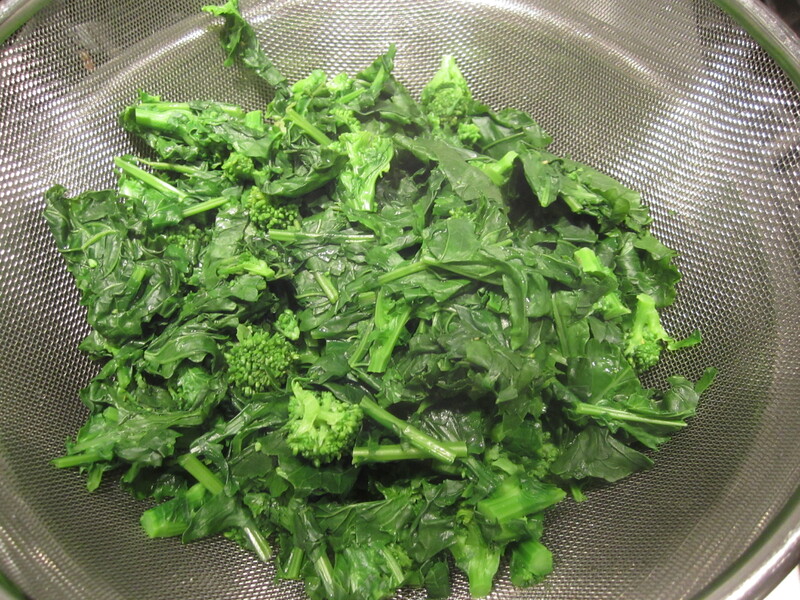 Chop broccoli crosswise into 1″ pieces, eliminating the bottom inch of stem. Drop into boiling sated water for 3 minutes or until crisp-tender. Drain and set aside. 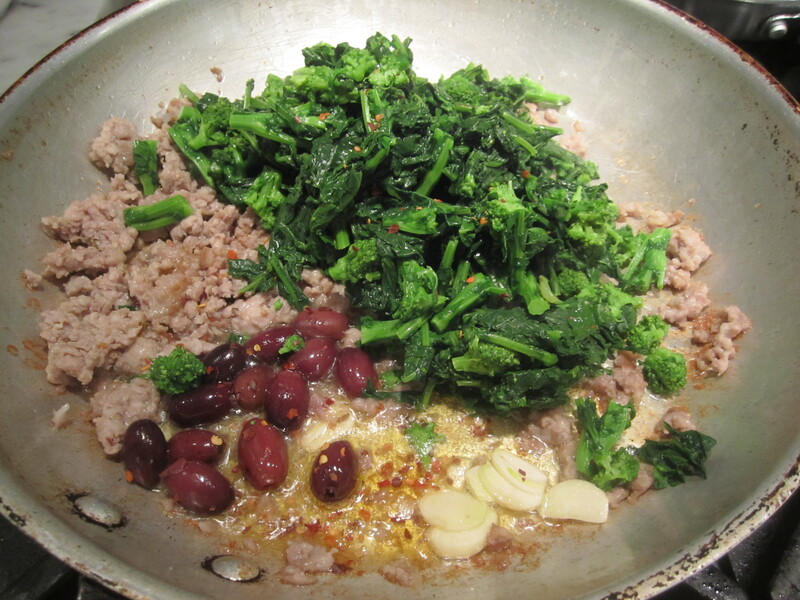 In a broad skillet on high heat, pour 2 tablespoons olive oil on high heat and add sausage. 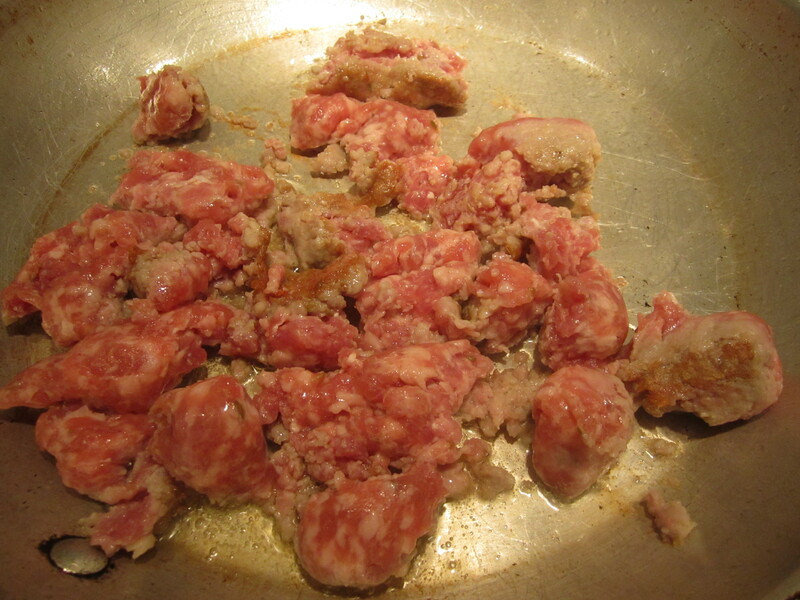 Saute while chopping with spatula, until sausage has lost all pink color and just begun to brown. Add garlic and olives, saute for about 4 – 5 minutes. Add broccoli and chili flakes and continue sauteing for another 2 minutes or until pasta is ready. Boil pasta in plenty of salted water until done. Add drained pasta to skillet of sauce. If not serving immediately, allow pasta to sit atop the condiment until ready to finish the dish. 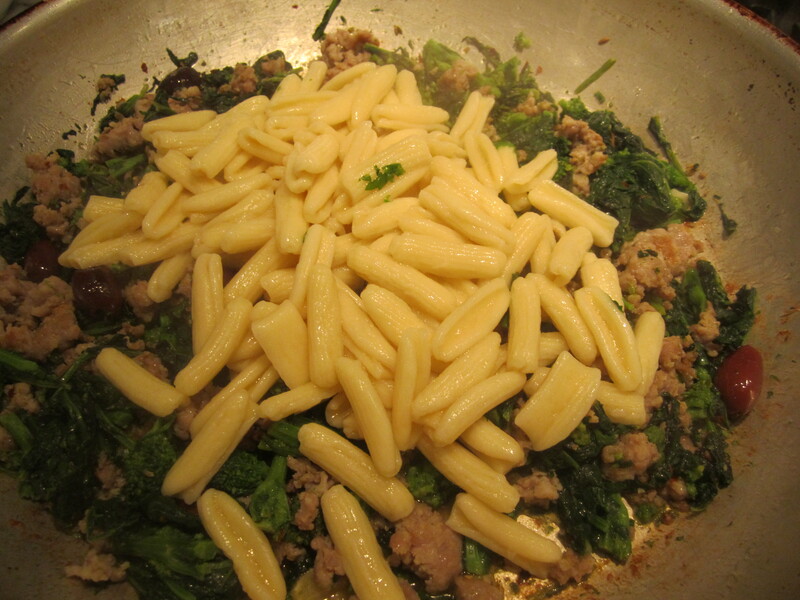 If serving immediately, stir pasta into sauce, adding a cup of pasta water and the remaining olive oil. I made this delicious dish last night, but with turkey sausage. Was the first time I cooked with brocolli rabe. It was so easy. And the first time I uncased sausage, I slit the sausage down the middle, and uncased directly over the pan. Quick and easy. I brought my left-overs to the office today for lunch, including some grated pecorino, and my staff is asking what in heaven i’m eating. i told them it is heaven indeed and sent them your awesome blog.